Many of my succulents have been outside on my covered porch with no problems, but one Gasteria has continually been full of fine spider webs. I've pulled them off, but they keep coming back. I can't see any spiders. How can I get rid of the spider/s when i can't see them? This sounds more like spider mites, which are so tiny you need a magnifying glass to see them. 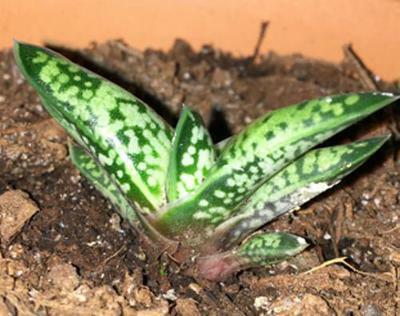 You'll need to isolate the plant from others - the little spiders are active and will move to other plants. The problem with putting your plants outside is that if they are the slightest bit susceptible, they'll pick up hitch hikers. I recommend getting into a regimen of spraying the plant with plain water twice a day - spider mites don't like water. The trick here will be to avoid getting water pooling on the plant, especially if it's in the sun. If this doesn't work, go to the next step - insecticidal soap. Read the directions on the package, and only use the strength recommended for the pest.